Place names help tell the stories of the place. During the reign of Māʻilikūkahi, who ruled in the 1400-1500s (at about the same time Christopher Columbus crossed the Atlantic,), invaders from Hawai‘i and Maui arrived on O‘ahu. In the battles, the O‘ahu forces met the opposing forces in the uplands of Waipi‘o, and a great battle occurred. 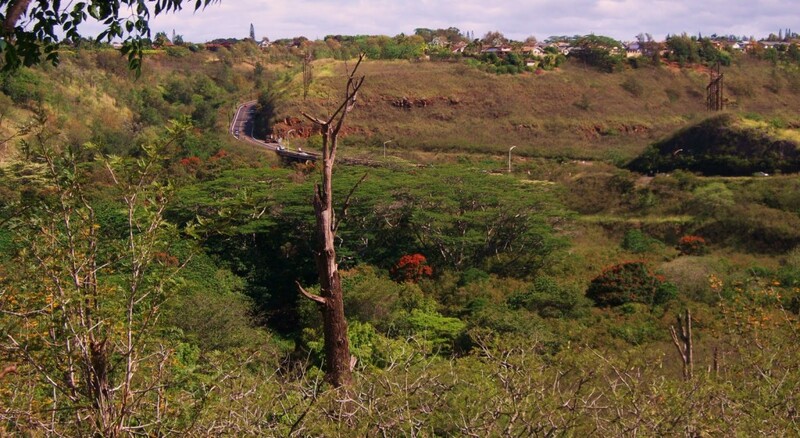 Māʻilikūkahi was raised partly in Waialua and is said to have maintained a kulanakauhale (village) there. What is commonly referred to as the “ahupuaʻa system” is a result of the firm establishment of palena (boundaries.) This system of land divisions and boundaries enabled a konohiki (land/resource manager) to know the limits and productivity of the resources that they managed – and increase its productivity. Thrum notes that while Māʻilikūkahi was peacefully disposed, he proved to be a brave defender of his realm in thoroughly defeating the invading forces. Fornander suggests it was not considered a war between the two islands, but, rather, it was a raid by some restless and turbulent chiefs. The invading force first landed at Waikīkī and proceeded to ʻEwa and marched inland. At Waikakalaua (an upland ʻili of Waikele) they met Māʻilikūkahi and his forces, and a bloody battle ensued. The fight continued from there to the Kīpapa gulch – stretching across Kīpapa (an ʻili of Waipiʻo,) Waikakalaua and the place known as Punaluʻu. Tradition has it that the body count from the invaders was so great that it is said the area was paved (kīpapa “placed prone”) with their bodies. Punaluʻu, an upland ʻili, was named for one of the invading warrior-chiefs killed during the battle. Another warrior-chief, Hilo, was also killed in the battle. Poʻohilo (an ʻili of Honouliuli) is named from events following a battle in the Kīpapa-Waikakalaua region in which the head of Hilo was placed on a stake at this site and displayed. Kanupo‘o (an ʻili of Waikele) may be translated as meaning, “planted skull” and seems to imply an event of some importance – it may be tied to events of the battle at Kīpapa and the naming of Po‘ohilo at Honouliuli. Today, people suggest the gulch is ruled by the spirits of fallen warriors; there are reports that this is one of the paths of the Huakaiʻpo (night marchers) and other reports suggest a woman dressed in white hitchhiking. The airfield site is located south the Mililani Golf Course between Meheula Parkway and Hokuala Streets – the runways extended out to the edge of the gulch. Mililani District Park is located near the intersection of the 2 main runways. The use of this site by the Navy would permit the concentration of carrier-group training for Naval aviation on the south side of the island of Oahu including Barber’s Point, Kīpapa Gulch, and Ford Island. But it was not until sometime after the United States entered World War II that Kipapa Airfield was developed; the exact start date is not clear, but 1943 maps note the facility. During the war it apparently saw little use by the Navy due to the fact that carrier aircraft were constantly deployed during the war. The Army Air Corps became the principal user of the airfield by default. Aircraft from this airfield searched & patrolled over the surrounding Pacific area, maintaining a 24-hour vigil to avert any attack with a large number and variety of squadrons are documented to have been stationed at Kipapa Airfield during World War II. The image shows Kipapa Gulch. In addition, I have added other related images in a folder of like name in the Photos section on my Facebook and Google+ pages.